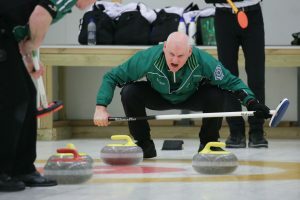 Seniors’ coach Gordon McIntyre has send through his notes from the men’s semi-final against Canada and the bronze medal game against Denmark so we can all find out exactly what happened!. 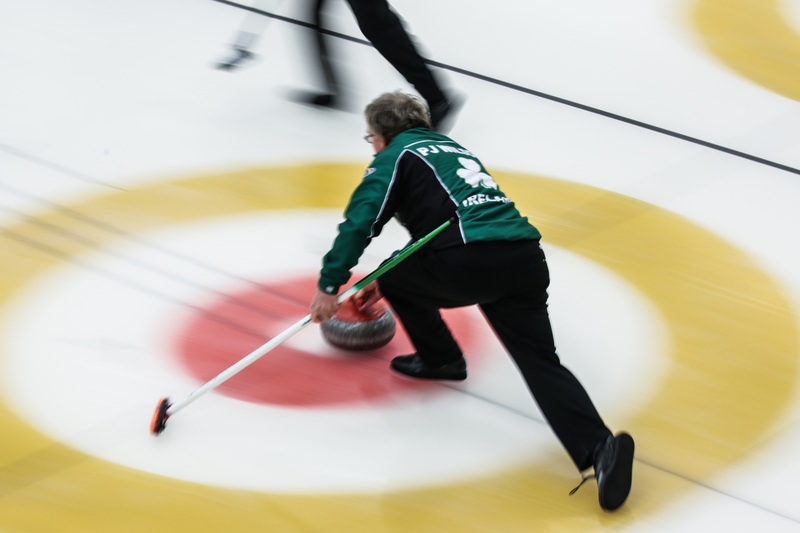 6th End – Stones into house allows Canada the opportunity to draw for 2. 3-6. 7th End – There is nothing in the house for Ireland when PJ plays, he is facing 3 and guarded, so peels guard, leaving Canada lying 2. PJ then tries going through a port for double, but not heavy enough, Canada still lying 1 . Pete also comes through the port, but his stone is lying open. Neufeld hits to lie 3. Not too many options for last stone. Going for tap back on outside stone. Just missed out 3-7. Game finished. Bronze medal game – winner takes all……. 5th End – Lots of good shots being played ( all all behind the tee ) by both teams. Ireland draw to lie 2, Neilsen goes for tap back, but plays heavy and runs past. Good steal of 2. 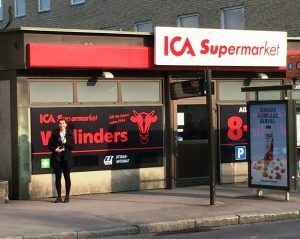 5-2. 6th End – Lots of stones in play. Neilsen tries the hit fora 2 and misses, so another steal of 1. 6-2. Coach said: “Big and difficult game tonight against New Zealand. 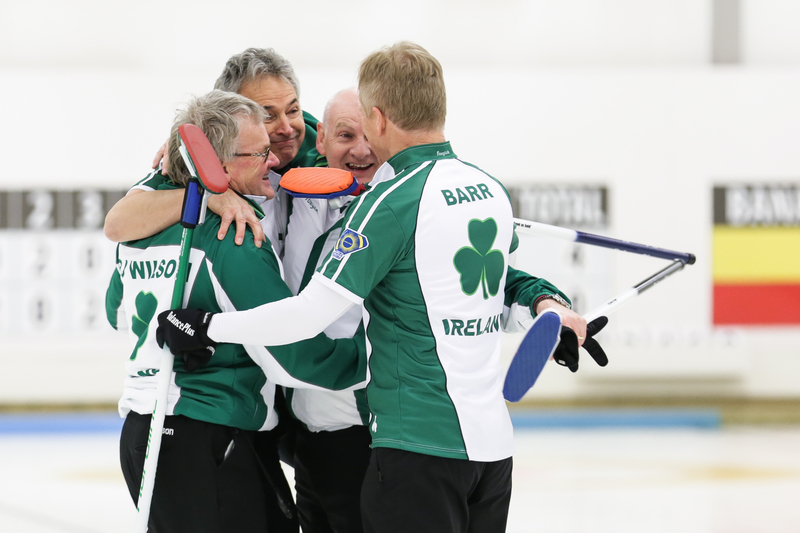 5th End – Great end for Ireland. Pete had a great cross double forcing the Frauenlob to draw shot. 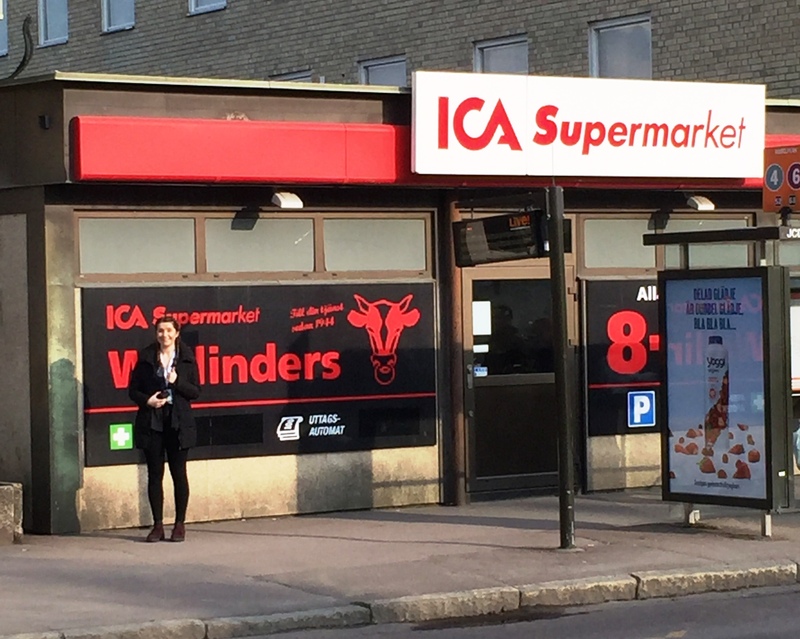 3-4. 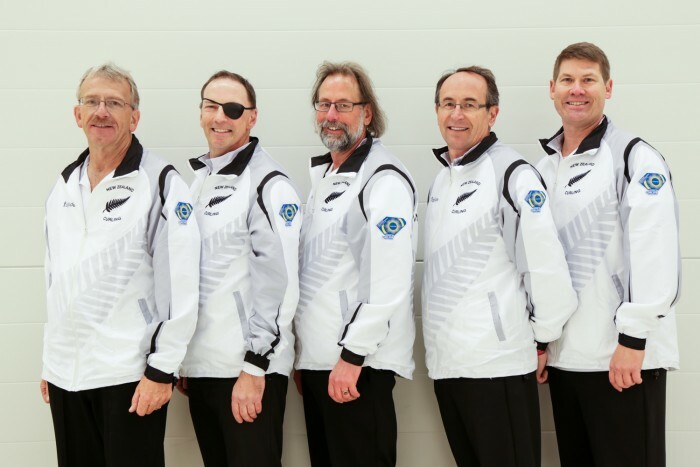 8th End – Turning into a very interesting end, NZL lying 2 with skip stones to come. Stone position not in our favour. Pete elected to go for hit and roll and just rolled too far. NZL still lying 1 with skips’ stones to come. Frauenlob peels his own guard. NZL still lying 1. 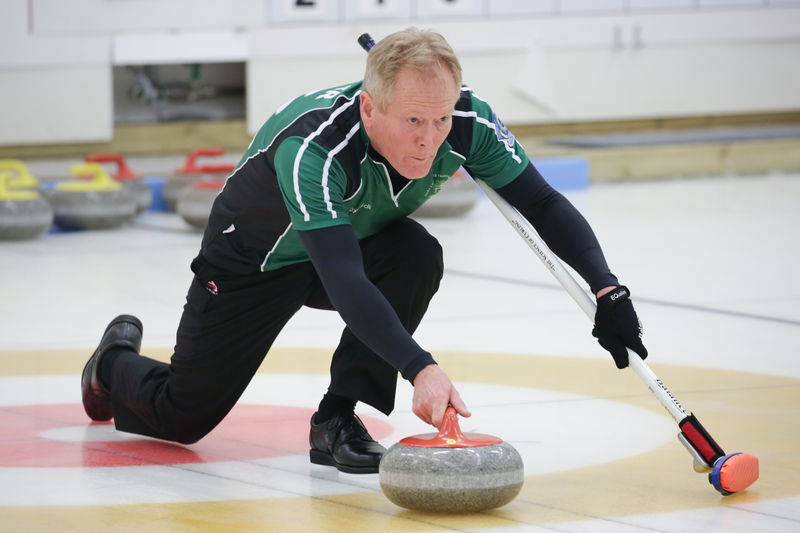 Senior Men – two ends gone and Canada have taken a two and stolen a two. Ireland 0 Canada 4. Two back for Ireland in the 3rd. 2-4. steal of one in the 4th! 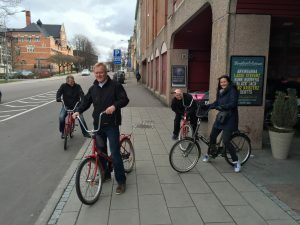 3-4. Ouch! Just lost a two in the fifth. 3-6 down. After losing another one, the brave boys shake at the end of the 6th. Still the bronze to play for. 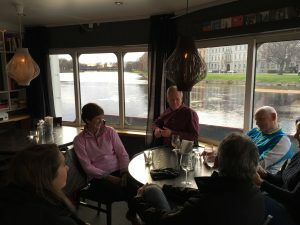 (Gordon’s game reports have been stuck in internet no man’s land for a couple of days, but they have come though this morning so I will put up a special ‘Gordon’s reports’ post when this morning’s games are over). Mixed Doubles – Slovakia also scored a two and stole a two. Ireland took one in the third. Slovakia 4 Ireland 1……4th end – lost another 2. 1-6 down. Two more lost in the 5th. 1-8 down. Neil and Ailson took one in the 6th but shook hands after losing a four in the seventh at 2-12 down. Still a game to go for them though. Great action shots just in from WCF photographers……..
Heavens! 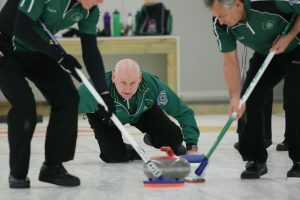 So much terrific curling in one day for Ireland. 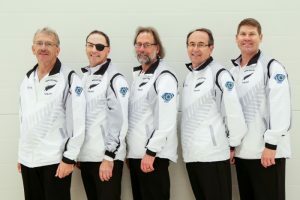 Pistol Pete leads his men into the semi-finals of the world seniors beating New Zealand by stealing a single in the last end! So proud of THE FAB FOUR – Pete, Peter, Ross and Tony! And, of course, wonder coach Gordon! 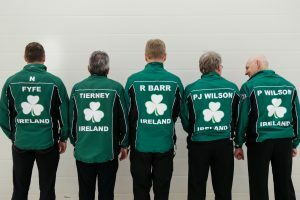 2nd end played, the Irish senior men are 2-2 in their quarter-final game against New Zealand. 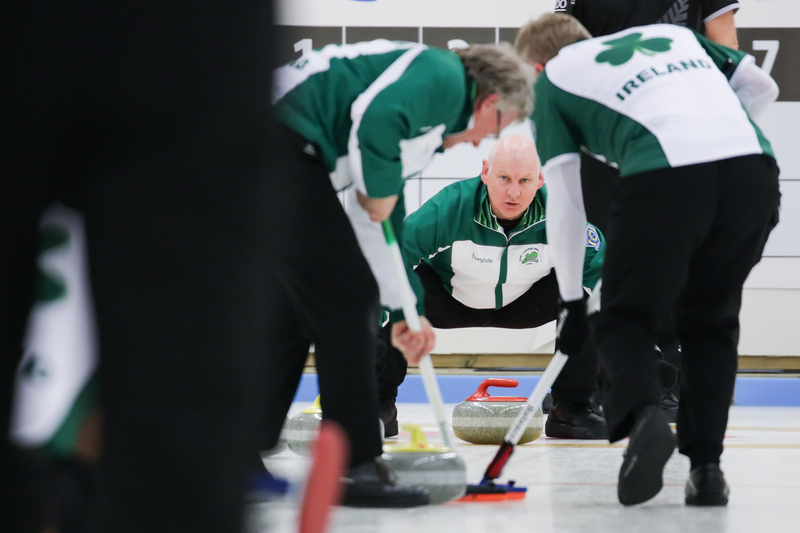 7th end – two for the Irish. 5-5. 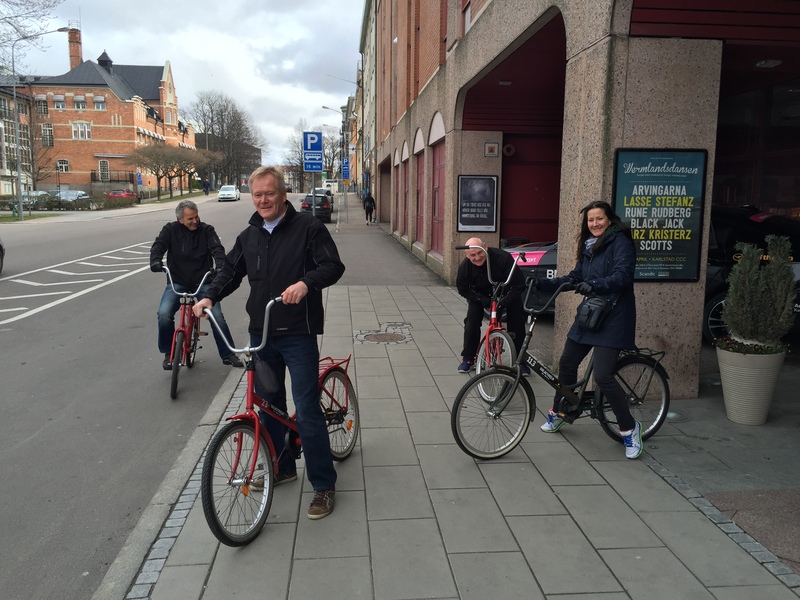 Come on Pete, PJ, Ross and TT!! The Irish Senior Men’s team, skipped by Peter Wilson, played Japan today in their final round robin game of the World Senior Curling Championships in Karlstad, Sweden. 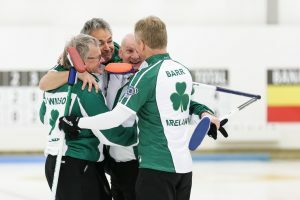 This was a close fought match with the Japanese leading 4-2 at half time and then the Irish coming back with a 1 in the 5th end and a steal of a 3 in the sixth. 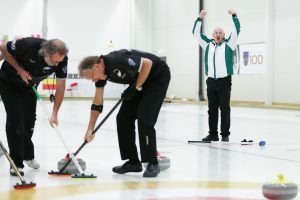 Japan fought back in the next two ends resulting in an extra end won by Ireland. 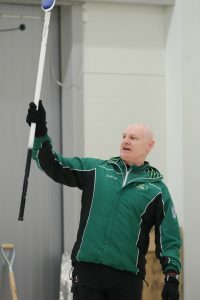 Coach Gordon said: “Pete had to play a great shot to win this in an extra end. 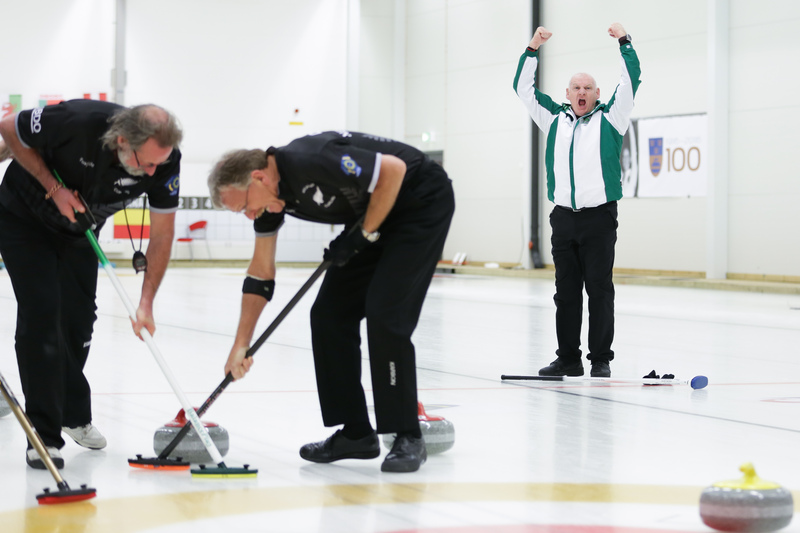 4th End – Japan were playing really well now and stole another 1. 5th End – Pete was left with an open draw to take a 1. 3-4. 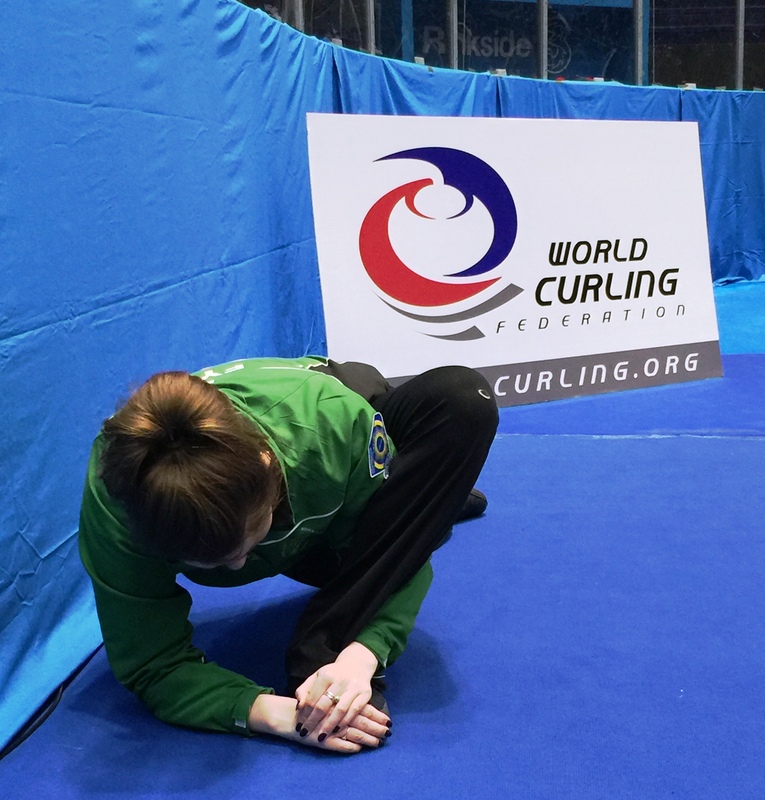 6th End – Things were looking better for Ireland this time with stones in play, forcing Japan to come out and attack. Komoda was facing 3 with first stone. He hit and rolled out to leave 2 Irish stones sitting, and Pete drew to lie 3 – without last stone. Komoda, going against 3, was too heavy and Ireland stole a big three to take the score to 6-4. 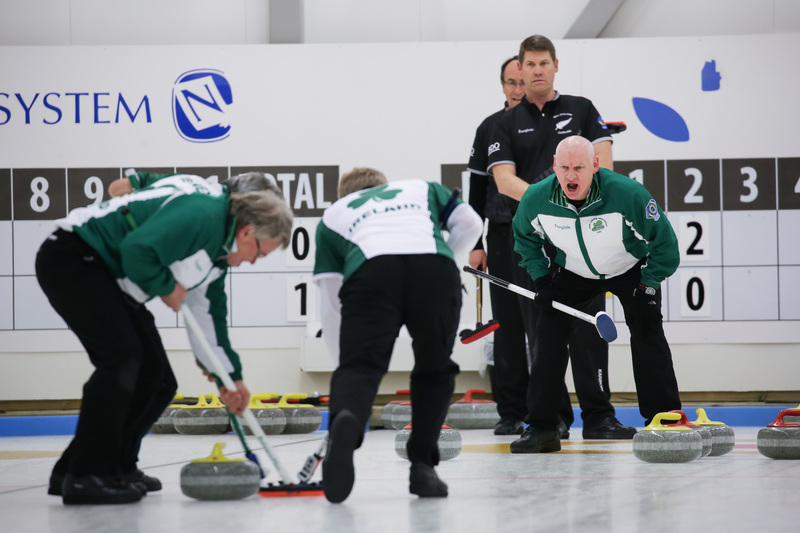 7th End – Ireland on the defensive with hits, Pete to draw to empty house behind guard. The shot was sitting out a little forcing Japan to hit and stay. 6-5. 8th End – Plan was to keep this end tidy and open at the front 12 foot. With his first stone Pete drew to the tee lying open. Komoda played a good freeze onto Pete’s stone. 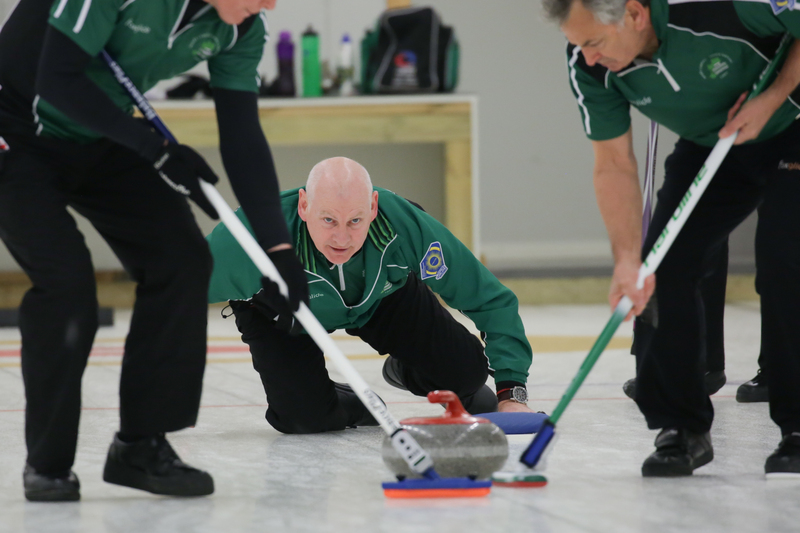 Pete has to follow but the stone was a little underswept and the game went into the extra end tied at 6-6. 9th End – At the death Japan were lying shot and guarded, forcing Pete to draw the shot under pressure. Which he duly did. 7-6 win for Ireland.. This puts Ireland through to the next stage – qualifier / quarter finals depending on rankings – well done. No one loves the big occasion as much as Peter Wilson which makes him a great subject for the WCF’s excellent photographers covering the world seniors in Karlstad. Do they get earplugs along with their press pass I wonder? The Irish Senior Men’s team, skipped by Peter Wilson, had a comfortable victory over France today in their penultimate round robin game in the World Senior Curling Championships in Karlstad, Sweden. A three in the first end saw them on their way and a three in the seventh end saw the French call it a day. 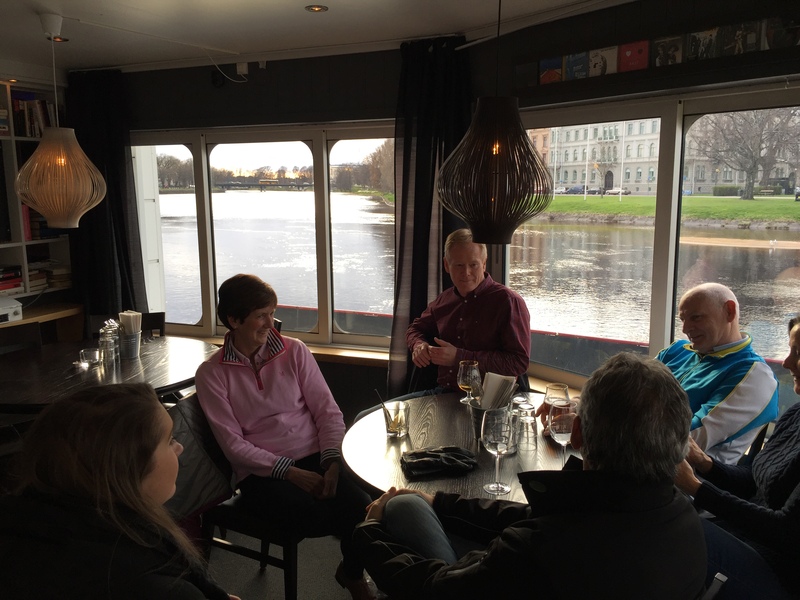 1st End – Good start to end, Pete and sweepers draw for 3. 7th End – The French skip was left to hit against 3 with last stone, he picked out 1, but left Pete a straightforward draw for a 3. Handshakes with the score 9-3 to Ireland. 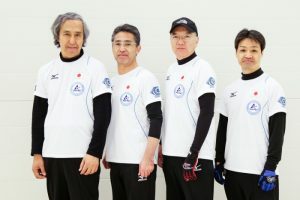 Their final round robin game is tomorrow, Thursday 21th April, at 12 noon against Japan. 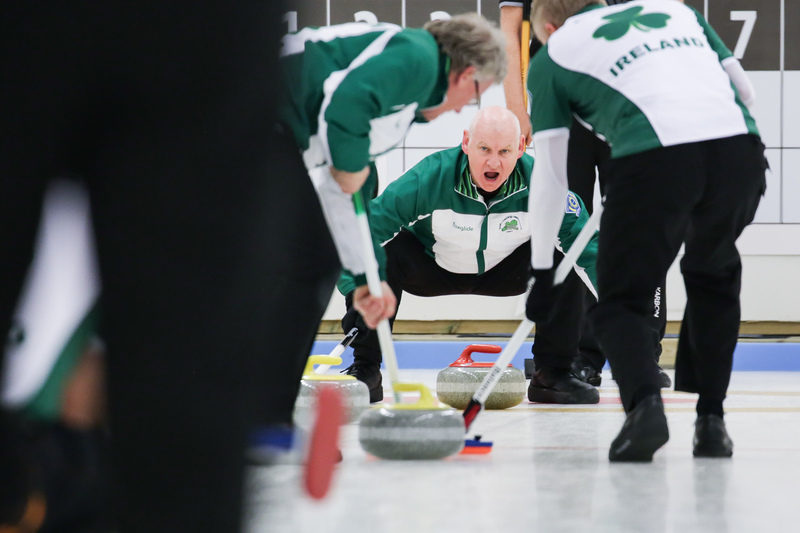 The Irish Senior Men’s team, skipped by Peter Wilson, lost to Sweden this morning in their 6th round robin game. 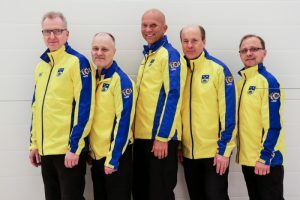 This takes them to the 4 wins and 2 losses in the World Senior Curling Championships in Karlstad, Sweden. 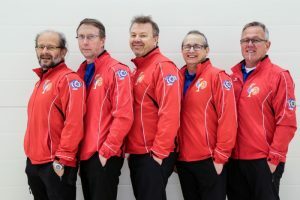 1st end – after an exchange of shot stone, Pete hit and rolled behind a guard with his second shot but Swedish skip Wrana came round the guard to tap the shot stone back for a 2. 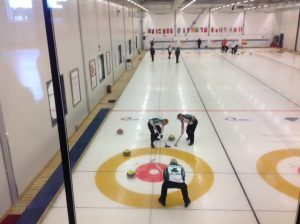 2nd end – This turned into hitting end that was blanked by Ireland 0-2. 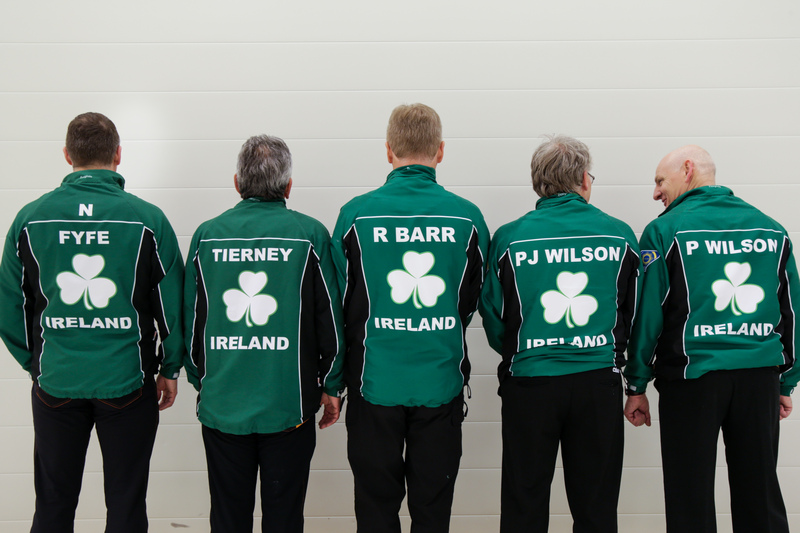 4th end – The front end, Tony and Ross, played well to build up the head as the Irish did not have last stone. PJ was unlucky when he just rolled out and Pete was facing 3 with his first stone, playing a cool hit to lie shot. Wrana hit and stuck to lie 3. Pete facing 3 again with his last stone. This time his hit through a port didn’t lie shot leaving Wrana the draw for a game changing 3. 5th end – Pete had to draw against 2 to take a 1. 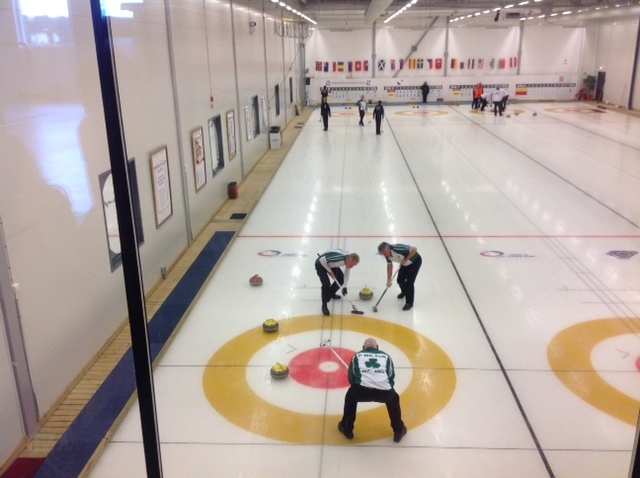 6th end – Pete had to draw the shot against 3, but with last stone the Swedes nailed the take out for another 3. 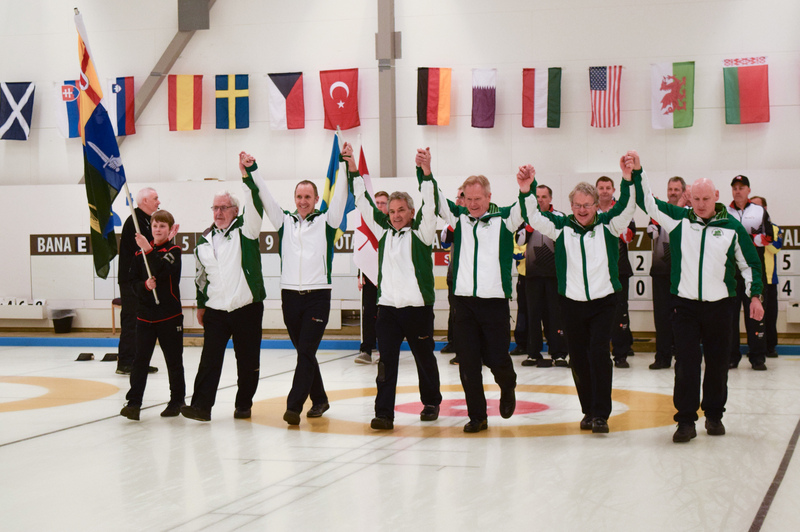 The Irish offered handshakes with the score 8-2 in Sweden’s favour. 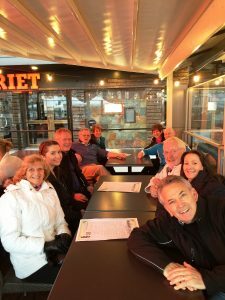 Their next game is tomorrow, Wednesday 20th April, at 12 noon against France.